The loss concluded the tennis week of his life for Tsitsipas, who beat four Top 10 opponent in a row to reach the final. 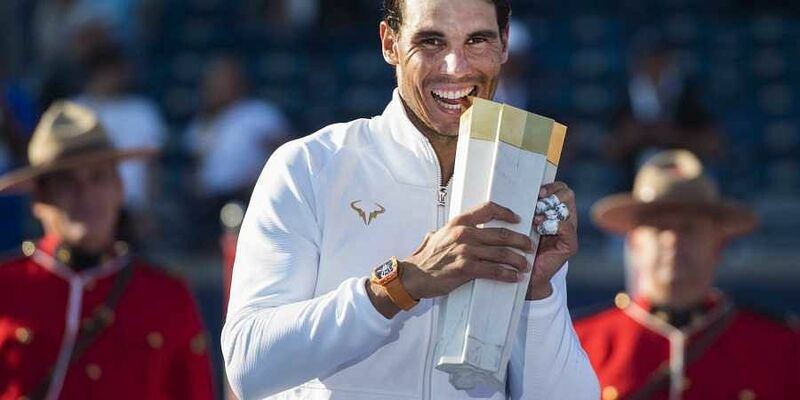 TORONTO: Rafael Nadal held off a late surge from birthday boy Stefanos Tsitsipas to claim the 80th title of his career with victory at the Toronto Masters on Sunday. Nadal overcame a second set fightback from Greek youngster Tsitsipas to claim a 6-2, 7-6 (7/4) victory in just under 1hr 45mins. The win gave the 32-year-old Spaniard a record-extending 33rd trophy at the elite Masters level as well as his 80th title. However, Nadal later raised doubts about he would be chasing an 81st title at next week's event in Cincinnati, refusing to confirm that he would play the event as scheduled. "Will I play in Cincinnati? I can't answer to you right now," Nadal said. Earlier, a vocal crowd of local flag-waving Greek fans sang Happy Birthday to the 20-year-old Tsitsipas as Nadal reflected on a successful campaign. "I feel I've improved every match, it's important to win even if you're not at your best," Nadal said as he prepares for the US Open later this month. "It's been almost 10 years (2010) since I last played in Toronto," Nadal said of the event which comes to the city in even-number years as it trades with Montreal. "This trophy means a lot." "It's been an amazing week for me," he said. "This trophy means a lot after playing my first Masters 1000 final. "Rafa is amazing, he never cracks. He will always grab you like a bulldog and he will always make you suffer on the court. "He was (once) normal like all of us, and he managed to become this beast, this monster that he is today. "That's how you feel when you play against him." Tsitsipas is taking the lesson he learned on court to heart: "I'm really hungry for more. I believe I can achieve much more this year. "Although I lost today, I feel like I can still beat good players. I really want to make more points this year and get the best out of myself." Nadal added the Canadian honour to the titles he won in 2005, 2008 and 2013. The final featured a plot twist at the end, with Nadal broken while serving for victory leading a set and 5-4. Tsitsipas would not buckle, making it 5-5 as Nadal hit the net, with the set finally going into a tiebreaker. Nadal regained control, earning a match point on a Tsitsipas forehand error. The Spanish world number one concluded victory with a forehand winner deep into the corner. He now owns five titles this season and has clinched the first spot in the year-end finals in London.